Before David Arroyo become a Painting Business Owner, were a painter on the field so he consider himself a not ordinary sales person, he does believe importance of knowing the field where you serve, this helping him to believe and train his crews about the need of the right tools for right application. he’s learned that a good paint job starts with quality materials. To help DIY painters do things right, David put together a foolproof shopping list of the essential supplies. 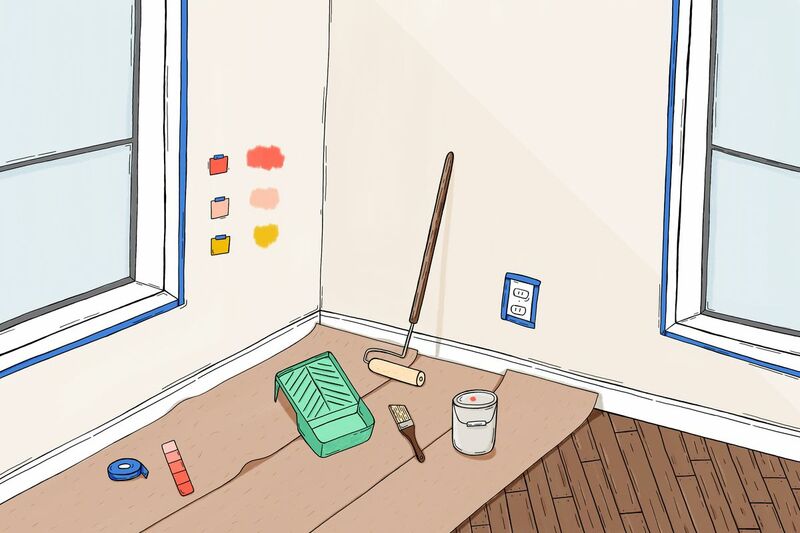 Here you’ll find a good starting point for the average interior paint job that doesn’t require too much damage control or problem solving for difficult surfaces. Many of these products will be found at independent paint specialty stores, as opposed to big box home improvement centers. After thoroughly cleaning the surface you’ll be painting, it may need a little TLC. “If you have holes and cracks, you have to use the right patching material. There are many different caulks, spackles, and compounds to treat the potential surface problems. Make sure that the one you choose is appropriate, paintable, and also fairly fresh this is why Brook Painting Exterior and Interior Painting is here to help you . “Don’t use stuff that’s been sitting around for years, cautioning that expired products won’t perform well. He’s had good experiences using the 3M Patch plus primer, as well as Sherwin Williams products, such as the Power house sealant . Homeowners need tape to protect certain elements from seepage, like baseboard or the line where the wall meets the ceiling. When choosing a tape, ask yourself how long the tape will be left up—the longer it’s left to stick, the more likely it will allow drips to creep through. First choice is Frogtape Multi-Surface Painter’s Tape. It’s green as opposed to the typical blue and can be left up to 21 days. He also likes 3M ScotchBlue. There are many different types of primers, so it’s important to use the right one for your wall conditions. For instance, a grease or water stain on a wall would need the right primer to seal the stain prior to painting. Or, brand new drywall needs to receive primer that seals the surface. Once you’ve identified any problem areas, read the labels thoroughly to make the right match. “There’s a specialty primer for everything,” We considers Problock from sherwin williamsa good go-to brand for these. Beyond the specialty versions, Hamberg suggests the following two as good all-around primers for basic interior jobs: Sherwin-Williams Multi-Purpose Primer for its stain-killing capabilities and Rustoleum’s Zinsser Bulls Eye 1-2-3 water-based primer. “For about 80 percent of the cases of where you need a primer, those would work,” he says, including on surfaces like wood, brick, and metal, as well as drywall and exterior siding. Another good primer for concealing rough spots or “alligator areas” on the exterior of your house is XIM Peel Bond, which is a primer and sealer. “It’s like paint assurance in a can, Another exterior product to try is Sherwin-William’s Rejuvenate Siding Restoration, which is a combined paint and primer that’s designed for adhesion and smoothing marginal areas. A paint roller is a great option for covering a lot of wall area rather quickly. It comes in two parts, the roller frame and its corresponding cover. You’ll only need to buy the roller frame once, and then change out the covers according to your paint job needs over time. You may also need an extension pole to help reach the ceiling or a tall wall area. To start,We recommends purchasing a basic 9-inch frame for your walls, and a smaller 4 ½-inch frame for interior doors, woodwork, and trim. Covers come in different fabrics—natural, synthetic, and foam—so it’s important to choose a fabric that fits the job and the paint. Use natural fibers with oil paint, synthetic fibers with water-based or latex paint, and a foam roller for high-gloss results. Finally, choose the nap according to the surface texture that’s being painted. “They have everything from ¼-inch nap to 1 ½-inch nap,”. For a smooth surface, such as interior doors and trim, pick a roller cover with shorter pile, such as a ¼ inch or sponge roll. For a semi-smooth surface, like plaster or drywall, pick up a 3/8-inch nap or a ½-inch. And for a semi-rough to rough surface (like stucco or brick), the best range will be between a ¾-inch nap to a 1 ½-inch nap. We prefers buying rollers from either the Purdy or Wooster brands. Brushes are needed to control the finish, reach difficult areas, and execute touch ups. Hamberg recommends starting with either the Purdy Clearcut or the Purdy Clearcut Elite(both with bristles cut at an angle). “It mimics some of the natural bristles and lays off smooth,” says Hamberg. Most homeowners will accomplish their needs with a 2-inch brush for trim and a 2 ½-inch brush for walls, and these should work for all different types of paint. We also likes the performance of Corona brushes. Most important is to clean the brush properly after each use. “Dawn dishwashing detergent probably works the best to get the paint out. Any five-gallon bucket will work. Then just pair it with a grid that fits your roller size (9 inches) and clips onto the outside of the bucket. (There are handheld, quart-size buckets with built-in grids for smaller rollers and brushes.) “You’ll wont have the need of use a tray.